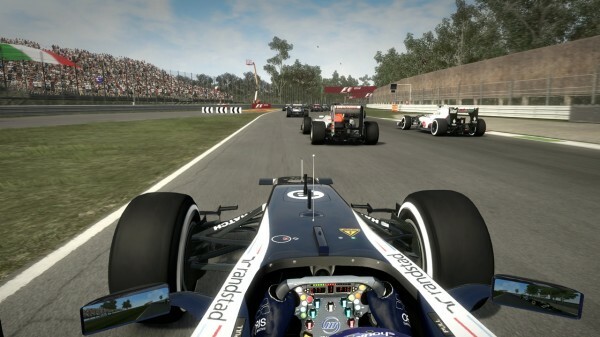 F1 2012 is an easy game to recommend to those who love Formula One racing. There's a lot to like about what is a very well crafted and polished genre release, which exists in the name of authenticity. The great thing about sport is that it encompasses a plethora of different event types, from water polo and kayaking to football and hockey, as well as visceral racing events like Formula One. There really is something for just about everyone, including those who love to watch team sports, individuals who prefer to cheer for a solo competitor and motor heads who love seeing machines fly around expertly crafted tracks found throughout the world. 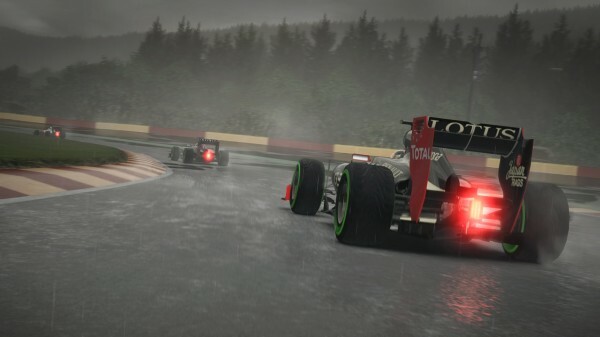 For the latter group, Codemasters has released F1 2012, its fourth, fully licensed video game based on the world’s most popular international racing category. Offering a sold list of event types, a hefty compilation of tracks and many of the circuit’s most popular drivers, it’s a digital experience that all fans should try. Before I move on to the detailed portion of this review, I need to be honest by saying that I’m not the world’s biggest Formula One fan, nor am I someone who follows the sport regularly. I’ve seen bits and pieces of it on TV over the course of my lifetime, but I mainly know the names of its most popular racers due to highlight reels and written recaps. However, with that being said, I do respect the sport, and happen to thoroughly enjoy top tier racing games, especially if they bear the Codemasters brand. Of course, this one proudly displays the British racing gurus’ logo, so I went into it with relatively high expectations and, to be frank, it certainly didn’t disappoint. 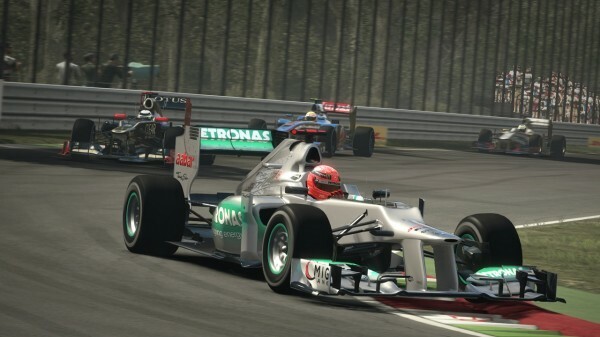 From the get-go, F1 2012 presents its developer’s trademark style of presentation. First, a creative and well-designed preview video plays. Soon after that comes a stylish, yet muted, menu system, which loads in after the player has typed his first and last name into required create-a-driver fields. That main page offers links to multiple gameplay modes, from Quick Race to the aptly titled Proving Grounds, and everything in-between. In fact, there’s quite a bit of content to be found here, which will definitely please the circuit’s most devoted fans. Skipping over the Quick Race option, because it doesn’t need much of an introduction or description, we’ll start with the one option that most players will spend the majority of their time with: Career Challenge. By selecting it via the main menu, one will find himself staring at three different gameplay options within a sub-menu. At that point in time, only the first mode will be unlocked, because one must complete driving school before moving on to either the Season Challenge or Career Challenge scenarios. It makes sense in a real world way, and also acts as a professional tutorial, which just so happens to last for two days. From beginning to end, Young Driver Training as they call it, is made up of eleven different challenges. Some are easy, while others are slightly challenging, and a few happen to only appear in video form. Even then, it’s important to pay attention, because you’ll need all the information you can get in order to do well on the track, as F1 2012 certainly isn’t a cakewalk. It’s difficult, but it’s also realistic, which means that winning doesn’t come easily. For that reason, it’s hard to recommend this experience to those who want a racing title that is easy to grasp and won’t take too long to master. Realistically, it’s best served for diehard fans and racing gurus, who will be willing to invest time in order to learn its intricacies. Casual, this release is not, although it tries to be somewhat accessible with its tutorial and easy mode, though even that low-sounding difficulty option is challenging. Once all of the presented tests have been passed with a metallic or chevron-based grade, it’s time to move on to one of the two main modes found on this game disc. First on the list is Season Challenge, wherein players pick a team and compete in a ten-race calendar, which consists of five-lap events. It’s stripped down and shorter than the average Formula One season, but therein lies part of its draw. That’s because the mode in question happens to be for those who don’t feel like they have the time for a lengthy, five-year and twenty-event career. During season play, team e-mails are sent and new contract offers will show up, provided the player has defeated his chosen rival(s) two out of three times. Furthermore, the user’s selected team will also ask for him to achieve specific placing results in each competition, like in real-life. Plus, there’s still the need to select a tuning type, though those who don’t want to get too involved may just stick with a mid-range set-up and their engineer’s chosen tire type. For some, default settings work, but getting your driver’s name in a celebratory newspaper clipping will require some planning. For those who’d like to sit down and really get into a lengthy and immersive mode, Career Challenge is a great option. It’s much more expansive than its peer, and provides more of an authentic experience. Teams can be selected from the get-go, and alliances can be switched later on, though this sim’s real draw comes from its focus on having players attempt to become the number one driver on their team. The task can be completed by winning teammate challenges, which essentially means that you must place higher than your peer in different races. Of course, that happens to be easier said than done, but avid players will certainly love the challenge. Additionally, they’ll find the in-depth tuning options, dynamic course previews and simplistic front end appealing. Then again, the previews are offered elsewhere, though they’re most important when you’re vying for victory in a pivotal Career championship race. Rounding out the single player offerings are the following options: Time Trial, Time Attack and Champions Mode. The first two are rather straightforward, tasking players with either setting a top lap time or completing a course within a certain timed parameter. Champions Mode, on the other hand, is a brand new set of one-off events. As its name suggests, it features several of the circuit’s top drivers, who must be defeated in their ideal conditions. It’s a neat idea, which should be well received by the F1 faithful, although there aren’t many scenarios to be found on its list. Granted, each one is quite challenging, which will add retries to most users’ clocked game time. Now, you’re probably wondering about multiplayer, which is understandable. I’m happy to report that there are, in fact, several different online-enabled options in F1 2012. First up is Quick Race, which, along with its Custom Event peer, lets players select from sprint, endurance and grand prix race types. Those who like to go in-depth with their settings and tuning options will want to create their own unique lobbies, and that’s great for them. However, some people just like to jump into a certain event type without feeling the need to strategize on a grand level. Thankfully, both experiences are offered, providing customizable races wherein up to sixteen players can compete against each other. Other than local and system link play, the only multiplayer mode that has yet to be mentioned happens to be the game’s best. Entitled Co-Op Career, it lets two friends play as teammates over a lengthy calendar. Fans who love to sit down and watch Formula One races with friends will surely appreciate this competitive, yet friendly, offering. 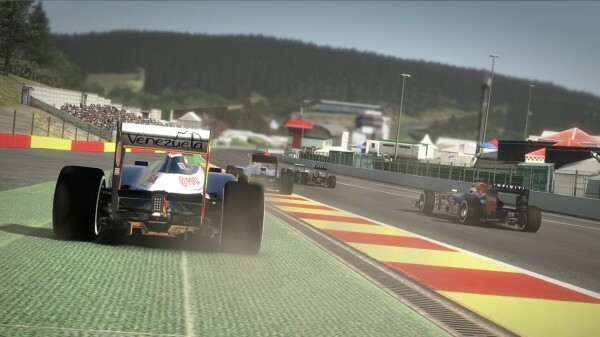 From a gameplay standpoint, F1 2012 is a checkered flag victor. It’s authentic and unforgiving, opting to go with a practice makes perfect approach. Driving assists help out quite a bit, but it’s still possible to spin out and/or crash on easy. The nice thing for beginners like myself, however, is that each race allows for several rewinds, letting us forget about a select amount of problematic crashes. It may not be a feature that the more seasoned crowd will like, but it makes the experience more appealing to newcomers. However, even with the rewinds in play, it’s tough to earn a victory. Controlling each car works as you’d expect, with the basic control scheme requiring the controller’s left joystick for steering, while its triggers act as gas and brake pedals. If you ever want to use a vehicle’s drag reduction system or its kinetic energy recovery system, both of which help to lower lap times when used effectively, only two buttons are required. It’s all rather straightforward, and I didn’t have any issues with the noted design, apart from times when I wanted to switch the camera’s location during hectic races. Doing so was often cumbersome. When it comes down to how this year’s iteration looks, sounds and performs, it’s easy to say good things. Every race I competed in ran smoothly, even during rainy weather, and each track featured a nice amount of detail. The cars themselves all looked quite good, although there were a few ‘jaggies’ to be found. Going further, they all sounded very realistic, with roaring engine sounds that may make some decide to lower their chosen volume levels. However, it’s important to keep your speakers at a decent setting, because important radio chatter is spoken during each competition, in order to let the user know if he’s being tailed, whether he’s getting close to an opponent, or where his rival is positioned. 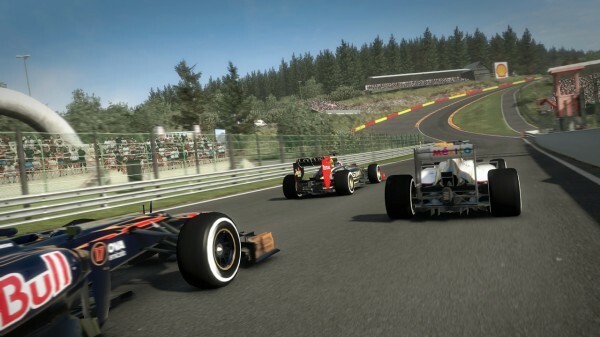 In the end, F1 2012 is an easy game to recommend to those who love Formula One racing. There’s a lot to like about what is a very well crafted and polished genre release, which exists in the name of authenticity. If you happen to be looking for something of this ilk, definitely give the Codemasters Racing team’s latest offering a shot.